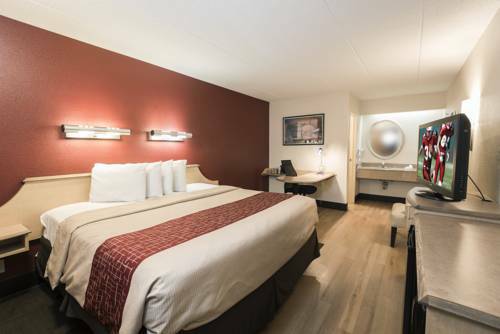 Red Roof Inn Rockford offers Newly Renovated rooms with Flat Screen TVs and are 100 percent Smoke Free. For fun, shopping and sports, come to Red Roof Rockford! Were just 2 miles from Magic Waters Waterpark, Cherry Vale Mall, and St. Anthony Hospital. Boone County Fairgrounds, Metro Center, and Rockford Speedway are all just a 10-15 minute drive from this hotel, while Sportscore is just 20 minutes away. Were conveniently located directly off of I-90, within minutes of a variety of restaurants. For fun, shopping and sports, come to Red Roof Rockford! Were just 2 miles from Magic Waters Waterpark, Cherry Vale Mall, and St. Anthony Hospital. Boone County Fairgrounds, Metro Center, and Rockford Speedway are all just a 10-15 minute drive from this hotel, while Sportscore is just 20 minutes away. Were conveniently located directly off of I-90, within minutes of a variety of restaurants.